The college bum, Sean Teeter, returns tonight with a Star Wars review. It's all yours, Sean! Any Star Wars fan and figure collector knows the value of a good troop-building figure. Extensive dioramas can look even beefier with a dozen Stormtroopers or so lined up behind Darth Vader or a few pairs of Royal Guards surrounding the Emperor. The Imperial forces have many different troops to choose from, be it their officers, Stormtroopers, Sandtroopers, Snowtroopers, Biker Scouts, AT-AT drivers, AT-ST drivers, and TIE Fighter pilots. 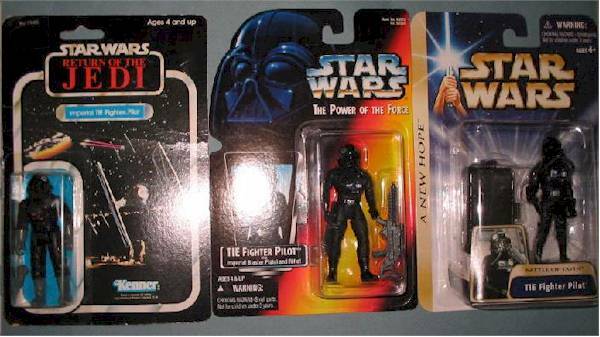 All of these figures were produced under the POTF 2 line in one form or another. As sculpting and articulation got better at Hasbro, several of these were completely retooled for new release such as the Stormtrooper in the short-lived Comm-Tech line, and the Sandtrooper and Scout figures in the Power of the Jedi line. The TIE Fighter pilot from the POTF 2 line was re-released with the TIE Interceptor vehicle, then the TIE Bomber. With the Bomber, he was slightly tuned-up with knee joints so he could sit. With their latest wave centered on A New Hope (in particular, the battle of Yavin), Hasbro has gone back to the drawing board and given us a completely retooled TIE pilot. At one point in the past I gave this category three and a half stars because the simple blue and gold patterns looked really nice and classy, but in light of what Hasbro has done with their animated Clone Wars packaging, as well as the nice silver and black retro packaging for their upcoming Original Trilogy line, the blue and gold just doesn’t cut it anymore. The bubbles also seem to be made with cheaper plastic in some cases, leading to easily dented packages. I do have my issues with the pre-posed sculpt on the right arm, but I have to say that this guy is one hell of an improvement over the big-chested POTF 2 sculpt. All the wrinkles, pleats, pockets, and the wrist comm-link are done very nicely. The helmet is definitely the centerpiece of this figure and it’s pretty close to the movie version with its nice elongated front breathing section. The breathing tubes pop out of the helmet easily and the chest box comes off the figure with relative ease, as it’s attached to the chest plate via a peg. The chest box might be the same one from the POTF 2 figure, but I’m not entirely sure. Either way it looks fine. He’s basically all black, so there’s not much chance of screwing him up too badly. All the button and insignia details are painted on rather well, and there’s no sign of bleeding to be found. 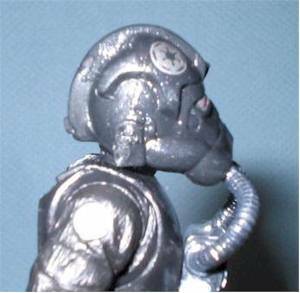 The TIE pilot has eleven points of articulation: a neck cut, shoulder cuts, a right elbow cut, wrist cuts, a waist cut, hip cuts, and limited ball-jointed knees. 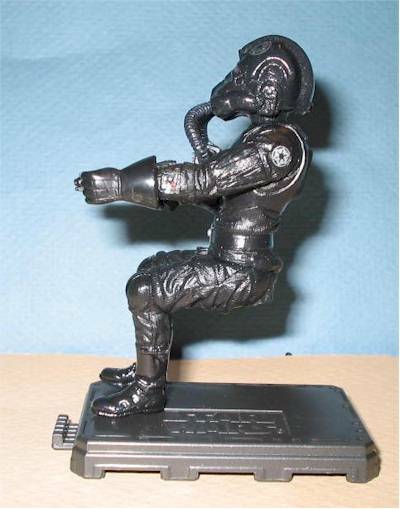 The breathing apparatus limits the neck cut, but the tubes can be removed to allow for full rotation. I would have really liked to have seen swivel or limited ball-jointed elbows on this guy, as the arm sculpts really limit posing. The elbow on the right one is so pronounced that you can’t straighten the arm out like with the Jedi Luke. The waist articulation is similar to Captain Antilles, as in the cut is below the belt as opposed to above it like on most other figures. The knees are great especially since as a pilot, he’s going to spend most of his functional time sitting anyway. There aren’t a whole hell of a lot of action poses he can hold because of his arm and neck limitations, but this isn’t a figure that’s going to do much beyond flying a ship or filling out troop ranks. I just wish the elbow articulation allowed for more poseability. 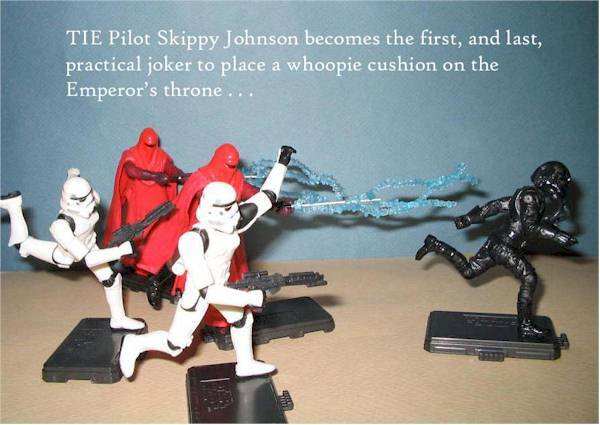 The pilot comes with an Imperial blaster and a stand. Hasbro continues adding their standard filler accessory with the plastic black stand. Like all the others, it’s supposed to connect with other stands, but the feature is klutzy and just takes up a little more shelf room. Of course none of the figures packaged with it so far have needed the stand to help stay upright. If you own any figure issued in the Power of the Jedi line that came with an Imperial blaster, then you’ve seen this gun before. That in itself is not necessarily a bad thing, since the POTJ Imperial blaster was a smaller, more realistically sculpted gun than the monster-sized version in the POTF 2 line. Too bad this one’s molded from really flimsy rubber. Also the handle’s way too small for the pilot’s right hand. He can hold it fine in the left one, but the right arm has obviously been sculpted with the blaster in mind. Keep the rubber band around his gun, or use the much better version found with the Cloud City Chewbacca, with the larger handle. I really can’t think of much else that could have been packed in with the TIE pilot, but the bubble seems really empty with just an inferior weapon and an unnecessary stand. I think a removable helmet would have been really cool, especially since the Imperial troops are supposedly all clones anyway –we know what his face would look like. The chest box is removable, but I don’t count it as an accessory. He’s pretty solid overall. The chest box can come off, but it’s not loose. He’s built to last, but his knee joints feel like they might loosen over time. While I feel the figure itself is pretty good, the sorry accessories take their toll on the value. However, the TIE pilot is probably a higher anticipated figure than something like Captain Antilles or Jan Dodonna, so most will be willing to overlook the accessories. You can find him at Target for $4.99, which is a pretty good price for most Star Wars figures. Pay more than that, and it’s always a judgment call. Amazon.com briefly had him in at $7.99 a pop. He’s currently out of stock, but more are on the way. They also have some of the other new figures in as well, including the Silver Clone Trooper. Cloud City has him on preorder for $8.99 on C-7/C-8 cards, $9.99 for C-9 cards. 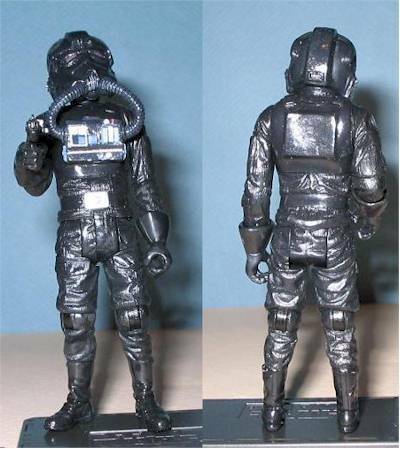 Planet Action Figure has him in a pre-sell deal with Jan Dodonna, Dutch Vander, and Captain Antilles for $34.00. And there’s always Ebay. Need I say more? This guy is certainly heads and tails above his previous version and we can all be thankful for that. However, he doesn’t work as well for troop building as he could because of his arm sculpts –they should have been neutral with arm articulation allowing for variation. If Hasbro wants to continue using cut joints at the elbows, they need to work along the lines of the Jabba’s Palace Luke Skywalker figure –allowing for both bent and neutral arms. Even better would be elbow swivels or ball-joints. In the end, he still looks pretty cool on display, and can sit in any of the produced TIE fighters out there, including the ones found in the vintage line. I just wish there were some more accessories with higher quality to go with him.